Peter the Great lived in a cabin on this site about 30 km. west of St. Petersburg when his nearby naval base was being built in the early 1700's. He liked it so much he decided to build a home here. This palace took nearly 50 years to build and has been remolded ever since. The pale line across the back is the palace, very wide side to side but not from front to back. This is the route to the front door, through formal gardens and fountains. It sits on a bluff overlooking the Gulf of Finland in the Baltic Sea. 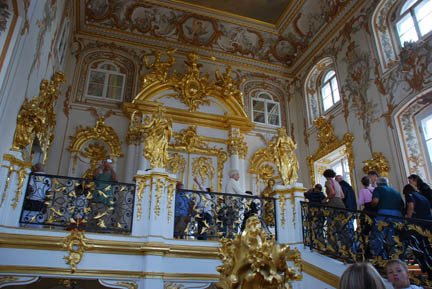 The Empress Elizabeth expanded the original with an extremely opulent interior. Catherine the Great toned it done and this is the result inside. This the main staircase. 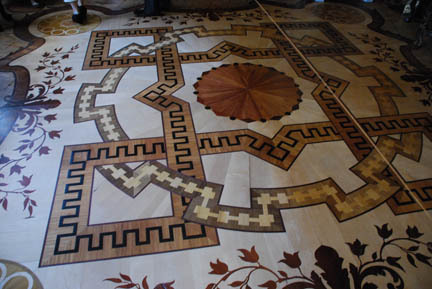 This is one of the inlaid wood floors. All the floors are of this type. We had to wear cloth booties over our shoes to tour the palace. This protected the floor. Probably the most amazing part of the tour is that none of this building is older than 50 years. Yes, I said 50 years. When the Germans in WWII laid siege to Leningrad (the name of the city then) the Russians had cleared Peterhof of everything that was not nailed down, furniture, paintings, chandeliers, etc. But the Germans decided to hold a big party there for the high ranking staff. They sent out fancy invitations to people. Stalin (the Russian leader) heard about the party and ordered that the palace be bombed. 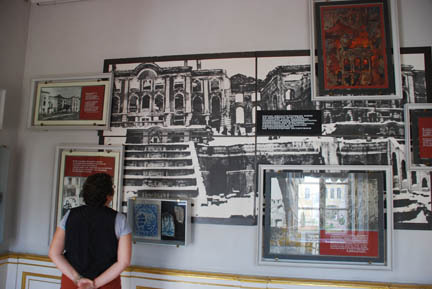 The black & white picture on the wall above Kathy shows the gutted palace. Just a few of the walls are left standing. After the war they started rebuilding it and then refurnished it with the original stuff. Quite amazing work. Out back on the bluff is Peter's famous water garden. This is called the "Grand Cascade" and the whole place is often compared to Versailles in France. 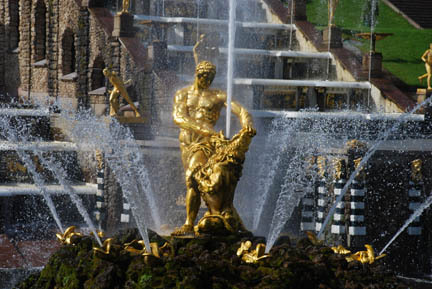 The centerpiece of the fountain is Samson tearing open a lions mouth. This all was designed by Peter and is all powered by gravity, no pumps. Off in the trees a ways there is a fun section of water fountains. 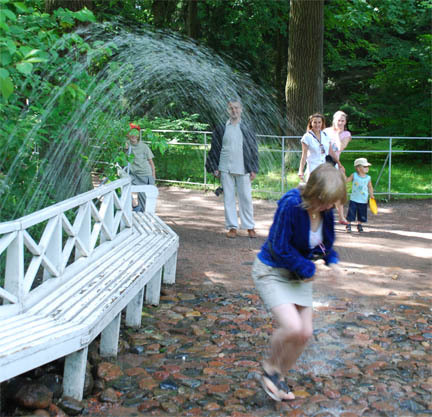 Step on the wrong rock as you walk by and you get a quick shower. The children were having a lot of fun trying to cross without hitting any of the trigger rocks. Sometimes they made it, mostly not. And then there was the duck game. These cast metal ducks rotated around the pond spewing water. 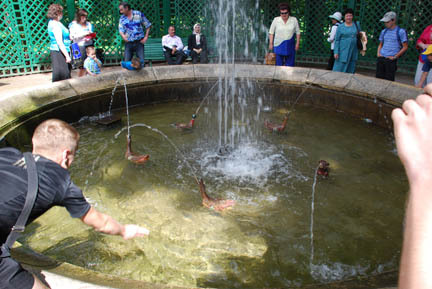 People would try to throw coins and have them land and stay on a duck's back. This seems to be a popular sport around here. This is the third coin toss game we've seen, each different. But then what else are you going to do with a 10 kopeck coin, they're worth less than a half cent US. And all this after Catherine toned down the glitz. There was one of these buildings on each end of the palace (with different but equally gaudy roofs). We didn't get to go in but the roof is enough to awe. It really shone in the sunlight! For this trip we had to figure out the subway (Metro) system. It is very deep underground. There are escalators to take you done and back up. They are about 100 yards long at a 45 degree angle putting you nearly 200 feet underground. Reading the names of stations in a foreign language has not been a problem for us so far, but all the letters were what we are used too. Trying to read in the Cyrillic alphabet was much more challenging. So we had counted how many stops were between there and here and just counted off stops. We got out and it was the right one! 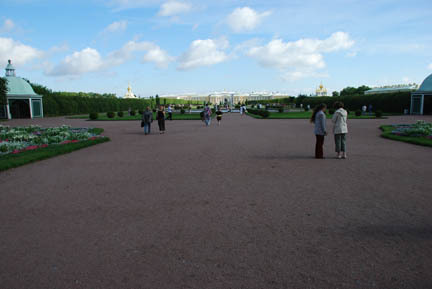 Then we caught the bus to Peterhof. This route through the suburbs led us past a lot of new housing, big houses, what we at home call McMansions because of the size and similarity in them. There was even one subdivision going in with over 50 McMansions in it. Some people have money here even it we didn't see any signs of it on the way in on the train. 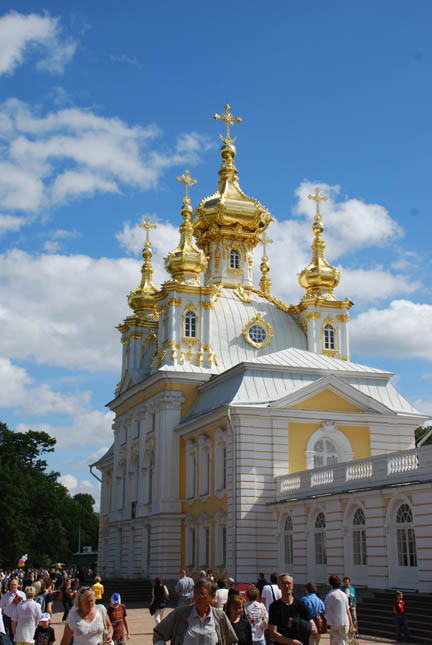 Tomorrow no Metro, only a bus as we go to Tsarskoe Selo, another of Peter's Palaces.